What does Samsung in store? Google, Apple, Microsoft and now Samsung - these are the companies (the big ones anyway) with developer conferences you can start looking forward to on an annual basis. 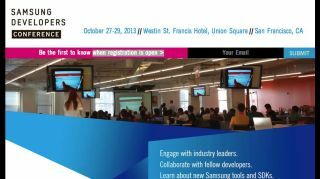 Sammy today announced its first-ever, multi-day global developer gathering is going down Oct. 27 through Oct. 29 in San Francisco. While you should prepare for APIs and SKDs, according to The Verge Samsung will use its dev con to make some significant announcements. The report noted Samsung won't pull an Amazon and make a split from Google by forking a version of Android, however the fact that the company feels it's necessary to hold an entire, multi-day event dedicated to codes and the like is an intriguing proposition, one we'll certainly be watching very closely. Blips take you where you want to go.